patterns just for making it all the way to the end. A great block for a border or sashing from Tim & Beck. American Jane does not have a blog, but she does have a doughnut block. If you were not able to download Barbara Brackmans block, here is a link. Last but not least a block from Lauren and Jessi Jung available here. Now on to the businees at hand. In From the Cold blog post. help create a myriad of projects. let me show you one way to put the “size matters” blocks together. Moda for a little over a year. Can I just say I love my job. and work them into a pleasing quilt. Size was not on my mind. or earthy tones of Kansas Troubles. Being an over achiever from birth, first born of course. and had a vintage look to them. I started with Layer Cakes. 40 different prints in each one. so I also made them in 3” blocks. By the way, I love miniatures. different type and sizes of blocks. You can use the smaller blocks in borders and focus on a bigger block in the middle. Have I ever made a medallion quilt? No, I’ll just read up on them and start sewing. and skimming through Pinterest I was ready. How hard could it be, ha! 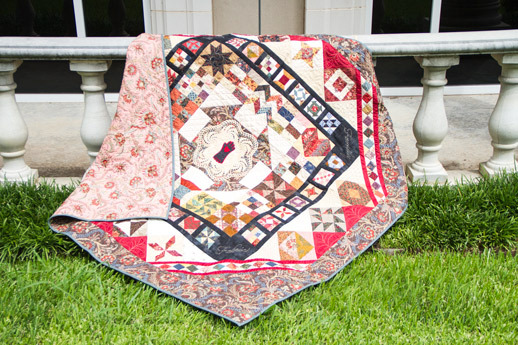 Did you know Martha Washington, our first first lady, made medallion quilts? stand out and allow you to fudge at the corners if you have to. to soften the black blob. Faith, Family, Friends, and Fabric. My life revolves around these things and I need all of them in my life to function. I need to touch it, smell it, organize it, iron it, cut it and sew it to be happy. but no commitment to any. That sounds very similar to life. but I am very happy with the way it turned out. the pattern than they are in my quilt. out the borders on the bias. grandmothers hand crochet doilies adding a touch of my family to this quilt. that a dear friend had drawn from me years ago for a craft business. I hope you love this layout and want to do all the different block in the different sizes. great quilt, I mean life….. Here are the directions for the medallion layout. entire list of moda designers, please click here. Oh what fun this has been. I just wanted to convey that this is my first blog hop that I’ve participated in and I truly enjoyed hoping, reading all the stories of the designers and collecting the blocks. I was not sure I was going to be able to “keep up” with the hop, but I did. Thank you Lissa and it’s a pleasure to meet you Tammy. Also “Thanks” to Moda, et al. 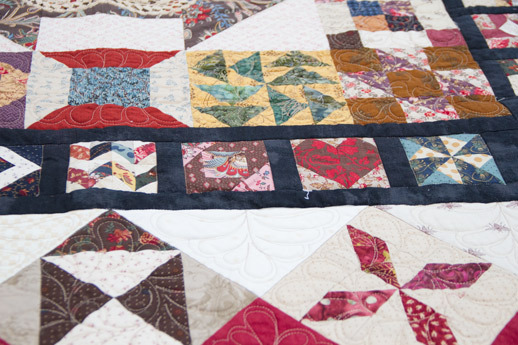 Thanks for posting the extra blocks, Barbara Brackman’s block and the quilt layout. It will be a pleasure to finish this quilt. Great blog hop…again! I really love these. I also love the final quilt. It is great. Thanks so much for the fun. Oh I wish I had made this quilt. Amazing! Thanks for this great hop , it has been such fun and so informative . 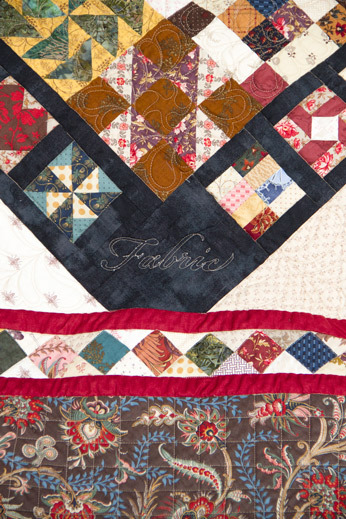 I love this final layout for the quilt , thanks again. Amazing job on the layout. I have enjoyed the blog hop. Moda is a classy company. That is a wonderful medallion pattern! Thank you so much for this fun hop…. I have met some very nice new people as well as a binder filled with patterns. Tammy…help please! 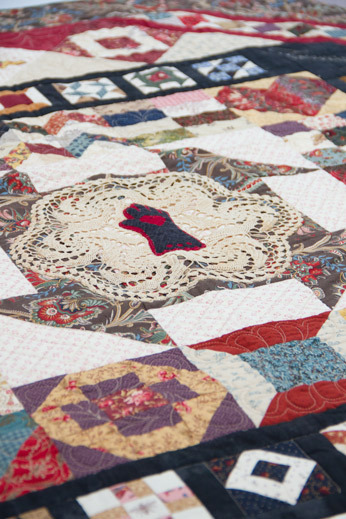 There is a block in your quilt right in between the spool block and I believe churn dash block. It has a white (or cream) square center with blue and white in a diamond around it. Then gold with a bit of red. I did the blog hop and this was not one of the designers blocks. I’ve got to make it! Where can I find instructions for the block? I love your idea for the centre block. I have some crochet made by my MIL that I would love to use this way. She always worked on a crochet or knitting project whenever she sat down. I know I have said it before but this was the best Blog Hop. I so enjoyed all the love the laughter the designers shared. A job well done by all. I learned so much from all of you. Thank you. 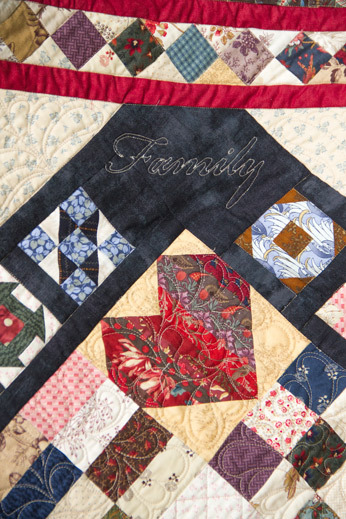 I am looking forward to seeing finished quilts from this project. I am not a piecer but I am willing to give it a try. Lets see how many points I can match. I already heard from one of my sisters. She stated…did you day you were going to try piecing. I just want to make sure I heard you right. I just love my sisters. Wishing all who read this a wonderful fun filled day with lots of love and laughter, The 4 of us. I luv the way you laid out this, its like a quilt within a quilt…beautiful! Thanks for the great blog hop…always enjoy them! I made all 6″ size blocks , but I love the idea of setting them with a medallion center and may draft my own. This was lovely and thank you all for hosting. It would be nice to have all the winners drawn by each host here on one site – I couldn”t get into some sites and no blocks up – so it would be nice to see the ‘acttual blocks/hosts/winner in one place. Wanda, thanks for catching the block we left off. It will be posted on our blog after 3pm central today. I’m so excited that everyone is enjoying the layout. Thank you for all the great blocks and patterns throughout this hop. The center medallion is a wonderful idea for those crocheted items from my grandmother and a great way to pass them on to other family members…Thank you! I’ve really enjoyed the blog hop and all of the blocks. Thank you for a great hop. Great job. We are women, hear us roar…I’m finished! I having trouble getting this last block – can someone please help me.. I click the link and it shows an error..
Ian, I can send it you directly…. I just added you to my Google circle. See if you need to ‘add’ me to yours in order to get my address and I yours. Moda, thank you for linking the L&J pattern… I was so bummed it couldn’t find instructions for it on their post! All I can say is WOW! This was fun! The 3″ blocks did make an interesting border with the added black. I liked the words you added in corners. 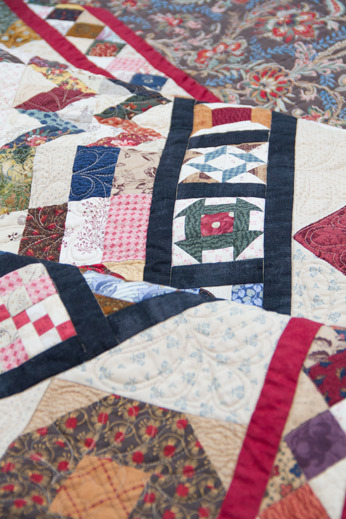 What a beautiful quilt and a great, fresh way to put all the blocks together! Thanks! This was fun! I have never heard of these before but I am very intrigued! I do love a good ruler for a specific job. Tammy you did an amazing job putting all the blocks together. I love the lay out and the blog hop has been so much fun! Thank you so much!!! !